To most, the American Cancer Society's fundraising goal of $72,000 would seem lofty for the Hancock County Relay For Life. That goal was absolutely obliterated as more than thirty area teams joined efforts to support the worthy cause and brought in over $84,000 with more still potentially coming in over the next few weeks. The top two teams raised over $14,000 a piece as Marine Bank & Trust's team edged out a team named "The Office" by about $500. In terms of top individual fund-raisers, Linley Bartell brought in $3,130, Maura Pintar raised $2,095.75, and Brenda Wagner was just under two grand at $1,755. According to Linley Bartell, Hancock County's Relay For Life event brings in per capita three times more than the national average. The incredibly stellar response to this event was rather impressive, and first-year participant Rick Goettsche was flabbergasted himself upon pulling up to the Relay site. He said, "I was really surprised at the scope of all that was going on in Carthage and all the people that were involved in it. I didn't realize this event was going to be as big as it was." 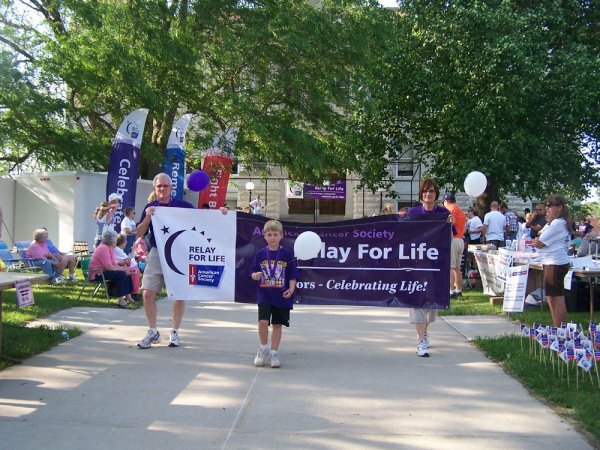 Goettsche's team was new to the Hancock County's Relay For Life with his team consisting of fellow members of the Union Church including his father, Bruce, Todd Porter, Janet McKoon, Cindy Pollock, Cheryl Blythe, Brenda Sparrow, Chuck and Barb Beane, and several others. While talking about this year's team, Rick went on to say, "Chuck and Barb were really eager to get involved in the relay and their enthusiasm spread through the group to help out as they had experienced first hand how much the American Cancer Society does in supporting those with cancer." Along with Chuck and Barb's first hand experience with cancer, teammate Brenda Sparrow's son, Justin, is a cancer survivor as well. Although this event is a consistent success year in and year out, leadership and coordinators will be needed to continue to keep this cause alive. Barbra Laffey will continue to serve as a co-chair for the event, but there is a vacancy for the other co-chair's position, which requires a two-year commitment.